Mary requested that someone from the design team use a silhouette file and do something for Valentine's Day, so that’s what I did! 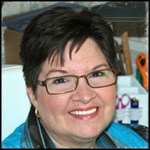 I used the new party card from Everyday Cards SVG Kit and the matchbox from Crisp Days of Fall SVG Kit. The silhouette is from Kate’s Holiday Silhouettes SVG Collection. I love the dimension of the Party Card and wanted to give candy with it. So, I put the Party Card card onto the matchbox for my candies. I love the final result! Here are the exact shapes, sizes and colors I used. Size to the dimensions shown below. If chart only indicated width OR height, Use "Keep Properties" or "Aspect Lock" to size files. 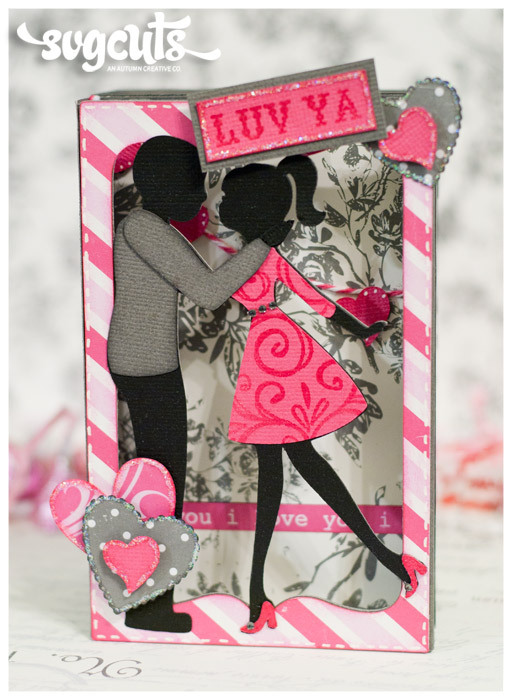 Before cutting out your Party Card, place your silhouette figure in the open window area. Position it as you like. Check the weld box for the silhouette and the card. Click on preview before cutting to be sure it did indeed weld. Cut out. Measure the back wall of the card and cut a piece of designer paper that size, ink the edges, and attach to the back. Cut your hearts for the back wall, heart_4. Ink edges. Using a pencil, lightly draw a line for your twine that will be the banner. Run a thin line of glue and lay down your twine on that glue. Arrange some of your hearts along the twine using foam dots. My designer paper had some strips to cut apart. One of them said I love you, so I used that near the bottom, an inch or better from the edge. If you don’t have that, just a strip of your patterned paper will work. 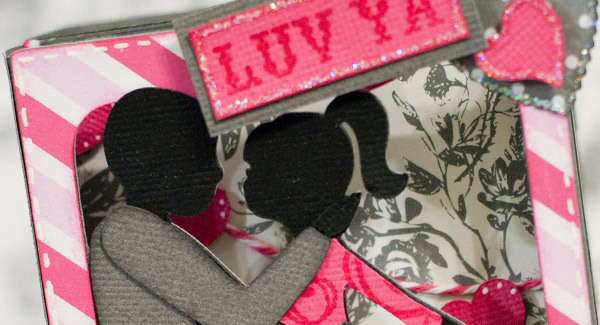 Cut out your silhouette in black cardstock. Cut the clothing in Designer Papers and attach. I used a swirl stamp with Versamark ink and clear embossing powder on her dress and shoes. I added tiny gems to the waist of her dress and the top of her shoes. When finished, glue this piece to the one you welded into the open area of the frame. You can now glue the edge of the Party Card to close it up. Cut out the hearts for the front of the frame. Ink the edges. Add Stickles glitter glue and or white gel pen accents if desired. Arrange as you like them, putting one or two on with dimensional adhesive. I stamped the word ”Love” and attached on the top edge. Cut the matchbox pieces. Assemble the outer box as instructed in PDF. For the inner box, since we had to re-size it, the score marks won’t be quite right, but will be hidden in the inside anyway. Fold your long sides up first. Fold up the short sides and measure it’s height along side of how tall the long sides are. Score and fold. You will have to trim a bit off the tab in order for it to fold in right. This should give you four sides that are all the same height now. Assemble as instructed in the PDF. Ink the edges if desired. Attach the Party Card to the top of the matchbox using a good amount of Scotch Quick Dry Adhesive. Hold in place till dry. I covered the seam between the two pieces with a thin strip of Designer Paper. 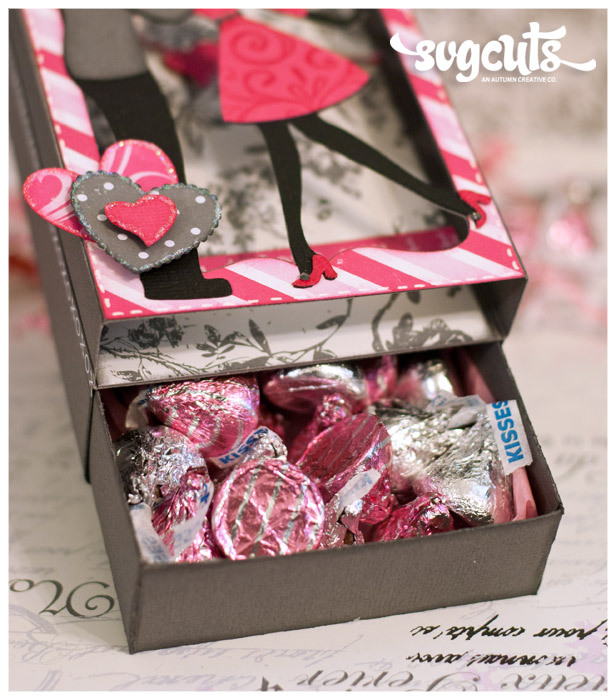 Fill the box up with tissue paper and candies! Because we had to size the box to fit the size of the card, the two short ends will be taller than the two long sides. Fold all your edges up, and then measure the ones that are too tall against the shorter ones. Make a small pencil mark, this is where you will score. Then just cut some off the tab, so it will fold up right. The score lines will be on the inside, but if you wanted, you could delete the score lines on the short sides and it won’t be an issue at all. Papers from one collection are nice to work with as they coordinate so well. But, use what you have. Attention to detail makes all the difference. Ink edges, emboss, twine or ribbons, white gel pen, glitter. That sort of thing. Make it yours with all the little extras. Be sure on the very first step that your silhouette did indeed weld. If you don’t check and it didn’t weld, it will cut it all out and you don’t want that. Click on the magnifying glass at the top to preview. Make sure ”weld” is checked on both the box and the silhouette. You will weld one silhouette and one will be cut in black. This will show the edges that disappear when you weld something together. This is a great little project to make for any occasion when you have just a little something to give. 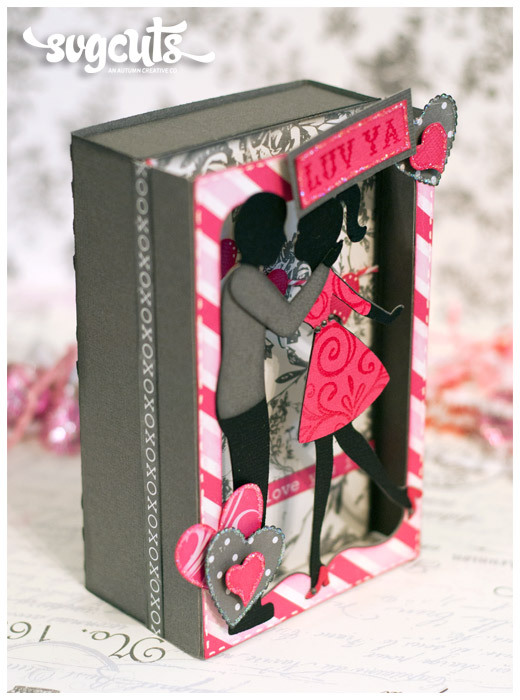 I takes it up from just a little box to a card/box that will steal the show! Let your fun side come through and make this totally yours. Anyone who receives this will be thrilled. Happy crafting! You’ve outdone yourself on this one!